Despite the popularity and central location of Donington, we continue to struggle to put together a decent grid there. It is hard to decide whether this is simply a lack of interest from our members, the format of the meetings we attend there, or, this year, merely part of the downward trend in grid sizes seen across the board. The bald stats to our grid are 12 entered, 10 arrived, 9 started. It was very disappointing. Not unexpectedly, Brian Arculus, who had substituted his Alfa Romeo for the Elite, put the Lotus on pole, 2.5 seconds clear of Kevin Kivlochan in his AC Ace Bristol. Just behind Kevin was Nigel Winchester in the special bodied AC Ace sharing the second row with Jim Campbell in his Austin Healey 100/4. Less than a second covered Kevin, Nigel and Jim, so potentially a good battle was in store. Stuck in no-mans land was Alex Quattlebaum who was nearly a second behind Jim but over 5 seconds clear of the rest of the field, the first of whom was Keith Hampson in his Sunbeam Alpine Le Mans. 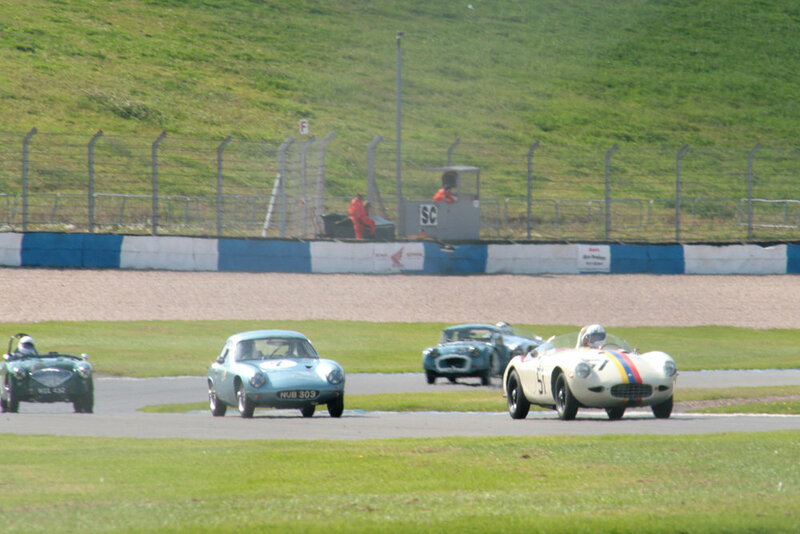 Keith was followed by John Waterson (Lotus Elite) , Mark Morgan & Andrew Mitchell (sharing Mark's AC Ace) and the two Triumph TR2s of Paul Ziller and Mark Hoble. Neither was where you would expect them to be but they had their reasons. Paul had, incredibly, repaired the damage following his roll at BDC, Silverstone (see report) but the car did not feel right on track and clearly needed fettling. He only did 5 practice laps. Mark fared even worse since after only 2 practice laps, the transmission failed as he was heading into Redgate. Everything locked up as he went straight on into the gravel and was consequently unable to take the start. Nine lovely cars lined up for the start of this race but at 30 minutes long it was unlikely to provide much excitement for the few spectators that attended this meeting. However, the start was enlivened by Nigel Winchester's stonking start from the second row in the South American derived special bodied AC Ace who burst through into the lead from the second row. Alongside him, Jim Campbell had also started well but was unable to follow Nigel, so settled into 3rd place, whilst a very good start was also made by Paul Ziller in the TR2. Paul seems to be making a habit of great first laps. Nigel managed to hold onto his lead for about three quarters of the lap before Brian Arculus took the Lotus Elite passed him, and as they completed the first lap, Brian, Nigel and Jim came through in close order having already opened up a gap to the fast starting Paul Ziller, now being challenged by Kevin Kivlochan who was just getting into his stride in the AC Ace and trying to make amends for a start which took him from the front row to 5th. Alex Quattlebaum (LECo2) came through in 6th, already over 4 seconds clear of Keith Hampson (Sunbeam Alpine Le Mans Coupe) and Mark Morgan (AC Ace). The leaders come through Schwantz Curve heading into McLeans for the first time. Nigel Winchester is still leading although he was to be overtaken by Brian Arculus before the end of the lap. Jim Campbell is established in 3rd, whilst in the background Paul Ziller is already coming under attack from Kevin Kivlochan. Photo taken by the writer through chain linked fence so not exactly a tour de force!